I am an experienced proofreader and beginner copyeditor who would like to work with academic publishers. I would like to get started with journals and move into books. Do you think this is a good approach? Academic journals usually have more strict requirements for conformity than books, and their chosen style is not always CMOS. Articles are tailored to a journal’s standard format, and there’s pressure to edit quickly to rigid deadlines. In this fast-paced workflow, copyeditors have little flexibility to organize their chores otherwise. In technical publications, or at journals where there is little or no contact with the author, copyeditors aren’t encouraged to engage deeply with the material, even though they often have advanced degrees and specialist knowledge. Finally, journals rarely make it a goal to produce lovely prose; there simply isn’t time. Book editors experience more variety and have more discretion. Each book is different in size, content, tone, and schedule. The copyeditor decides whether to accept an alien citation style and how to organize the work. Schedules tend to stretch, as editors juggle several books at difference stages of production. It’s usual to have constant contact and negotiation with authors. Although copyeditors routinely work on content they have no knowledge of, experienced book copyeditors know how to nudge incomprehensible prose into something more lovely, and nonspecialist manuscripts invite more substantive editing. I hope this helps you decide which path to follow. You might love journals editing, and if you do, why switch? In any case, here’s more advice on breaking in. In your book, you use copy editor but in your blog you use copyeditor? How inconsistent! One doesn’t write substantiveditor or stylisticeditor (stylistickediter??) or lineditor, so why copyeditor? I also prefer the clear distinction between copy editor and copywriter, which can be so easy to confuse at a glance when both are closed up. (I suppose that closing up copyeditor to match copywriter could also be an argument for consistency . . .) I’d be very interested to know why you have chosen to use the closed form in your blog, especially given the visibility of the open form on your book. Thanks. I’ve been on the lam from the truth ever since the book came out. But you’ve got me cornered. The jig is up. I’ll spill. Sometime after The Subversive Copy Editor had gone to typesetting, I was reading the first draft of the manuscript for the 16th edition of the Manual of Style, and I came across the word copyeditor, all one word, and nearly had a heart attack. I searched the whole text and it was the same everywhere: one word. CMOS 16 was changing it to one word, and as a result my book title wouldn’t be in Chicago style! I got hysterical and started shooting e-mails to stop the presses, which of course I didn’t have the authority to do. And in any case, it was simply too late. What I didn’t know but soon learned is that Chicago style for copyeditor had always been one word. I had simply gotten it wrong. I had been following Webster’s 11th Collegiate Dictionary, our designated dictionary, and I had never noticed that the style in the manual was different. To help me out, Russell Harper (the principal reviser of the 16th edition) went through the draft of CMOS 16 and eliminated every mention of copyeditor that he could. I think there are only four left, and two of those are in book titles. It was a heroic gesture that I will never forget. Ever since, I’ve been confused. I write it every which way. Check everything and still get it wrong... though why is it that there's always someone willing to point it out! CMOS or Oxford, I guess there's no absolute right | wrong. Just progress towards it. My world just fell apart. I'm now more confused than ever. I think this qualifies as an epic fail. Strunkinmytrunk, tell me what you mean! It sounds serious. 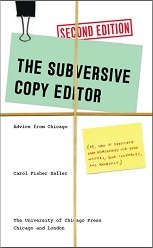 Carol, I've been wanting to ask you about copyeditor vs. copy editor for ages! I prefer copy editor, but I use copyeditor because of CMoS. Maybe I'll switch back to copy editor. Once my current business cards run out, that is!